An estimated 800 million voters (including approximately 100 million new voters) are eligible to vote in the Indian General Elections for the 543 seats in India’s 16th Lok Sabha (The Lower House). They begin on 7 April 2014, in geographical segments, and will end on 12 May, with the (electronic) results from 930,000 polling booths to be announced on May 16. 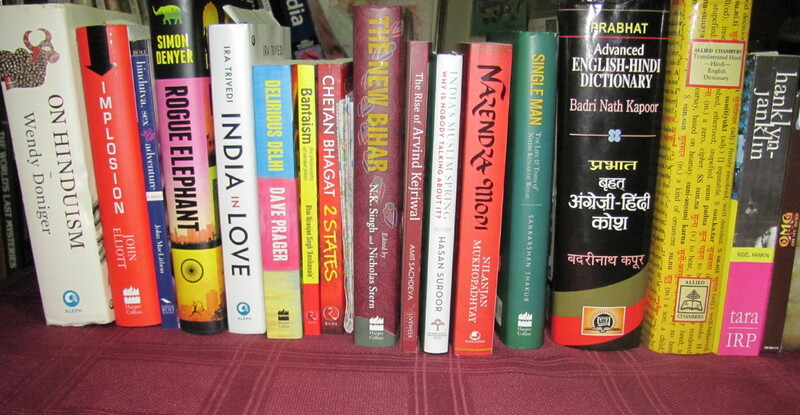 The Indian media has been in full cry for many months, and the final weeks are bound to be hectic and even more raucous, but a cornucopia of recent books containing vital background information (especially for outsiders) is available for calmer perusal. Here are some of the principle publications. Ramachandra Guha, India after Gandhi. The History of the World’s Largest Democracy.Picador India. Ramachandra Guha, Patriots and Partisans. Penguin India. Aseem Shrivastava and Ashish Kothari, Churning the Earth. The Making of Global India, Delhi, Penguin India. M.V. Kamath and Kalindi Randeri, The Man of the Moment. Narendra Modi. Wide Canvas. Noida. Vikas. N.K.Singh and Nicholas Stern (eds. ), The New Bihar. Rekindling Governance and Development. New Delhi, HarperCollins India. John Elliott, Implosion. India’s Tryst with Reality. Noida. HarperCollins India. 2014. Elliott currently writes for Asia Sentinel and blogs on the UK Independent. (Contrasting his approach with Edward Luce’s much earlier work, he favours the idea of ‘Because of the Gods”, “in the broader sense of culture, customs, and habits” (p. viii), rather than Luce’s “In spite of the Gods” approach. Andy Marino, Narendra Modi: A Political Biography. HarperCollins India. Amit Sachdeva, The Rise of Arvind Kejrival. The Uprise of a Common Man against all the odds, Gurgaon, Liveweek Business. Hasan Suroon, India’s Muslim Spring. Why is Nobody Talking about it? New Delhi, Rupa. Suroon describes the current push by Muslim youth in India to establish a more secular and forward-looking Muslim identity. His aim is to fill the void of (non-academic) reporting on what he sees as a profound change in local Muslim thinking. He also warns that the Indian State must make a better attempt to recognise and encourage such change. Sankarshan Thakur, Single Man. The Life and Times of Nitish Kumar of Bihar. New Delhi. HarperCollins. Sudesh K. Verma, Narendra Modi: The Gamechanger. New Delhi. Vitasta. On the sociological side, the following two works are of ancillary interest. The doyen of foreign correspondents in India was, and still is, (Sir) Mark Tully, of the BBC (and, subsequently, author of many independent books on India). Then came Trevor Fishlock of the London Times. More recently, we have been especially enlightened by Edward Luce (In Spite of the Gods (The Strange Rise of Modern India), 2007), William Dalrymple (on many aspects of India and Indian civilisation), and Patrick French (India. A Portrait, 2010). Now, as a lengthy commentary on his two reporting stints in India during the past 10 years, comes a timely and thorough analysis of contemporary India by Simon Denyer, a Reuters and Washington Post correspondent and Bureau Chief. As well as a general background to contemporary India, Denyer offers very close coverage of the past three controversy-packed years of Indian politics and public debate. All of these serious India Watchers are of British origin. In their prolonged scrutiny of India and her people, they have dug much deeper than most other foreign writers and journalists in a search for the realities of this ancient and enigmatic country. A further advantage they appear to share is a practical knowledge of Hindi and the ability to engage with Indians in different walks of life (and often in out of the way places) which has given their reports more authenticity and value, especially for non-Indians. This is surely further proof that although English is the lingua franca of India, Hindi remains the language of power and politics. Bedi, Kiran; Gandhi, Rahul; Gandhi, Sonia; Goswamy, Arnab; Hazare, Anna; Kejrival, Arvind; Kumar, Nitish; Modi, Narendra; Raja, Andimuthu; Ramdev, Swami; Singh, Manmohan; Vadra, Robert; Yadav, Lalu. “At the beginning of the twenty-first century, India seemed to stand on the brink of an exciting new era. Second only to China as the fastest growing major economy in the world, gleaming shopping malls were being built around the country to service a rapidly expanding middle class, and mobile phones were reaching even the remotest villages. “The installation of Manmohan Singh as prime minister in 2004 seemed to promise more good times ahead. Singh had unleashed ‘shining’ India’s potential more than a decade before as finance minister, introducing the liberalising economic reforms that had set the country on a new course towards prosperity. “Yet a decade later, the dream has crumbled. A series of corruption scandals has badly tarnished the nations image and undermined its self-confidence, while the economy has slowed and violence against women has dominated the headlines. The country is no longer ‘shining’ and Indians are left wondering where the magic has gone. “Reporting from across India, meeting activists, farmers, bureaucrats, office workers and media figures, and interviewing influential political leaders including Narendra Modi, Rahul Gandhi and Arvind Kejriwal, Denyer exposes the battles taking place between powerful vested interests and those trying to foster change. 5. Is there Something I should Know? “While Modi promises to cut through much of the tangled mess of governance and unshackle entrepreneurs, he threatens many of the things I love about India. I find Gujarat under Modi to be stifling, a state where cinema owners dare not show films about the riots for fear of violence, where criticism of Modi is interpreted as disloyalty to the state, where some of the oxygen of democracy has been shut off. ” (p. 360). Denyer’s Notes contain many vital recent bibliographical references, especially to relevant articles by himself and his Washington Post colleague, Rama Lakshmi, and to the work of historian Ramachandra Guha.